The original was used on 4 September 1914 by Stephen Hetley Pearson, Founder and Captain of Beeston Boys Brigade, to send a message to Harry Foxall. Harry, a pattern maker with Beeston Boiler, was an Old Boy, having previously joined Beeston Boys Brigade in July 1901, aged 15. In the message he writes, "27 of our old Boys have enlisted, 2 in A.S.C. and 25 in Notts & Derby (9th)...". Those that had enlisted from the team - virtually all those of eligible age - he had marked with a cross. 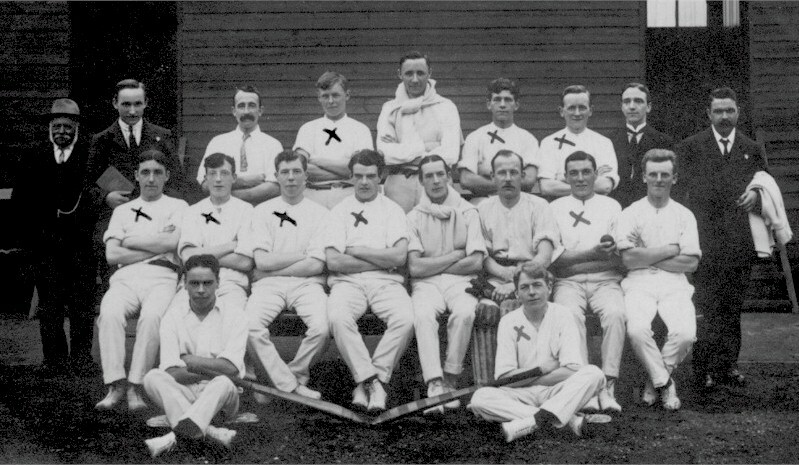 football team of a slightly earlier date, the man seated in the middle, with the sweater tied around his neck, appears to be Mr Searle. Bert Toon has identified two of his uncles seated in the middle row, Harold Lee (2nd Left) and Samuel Clemence Lee (3rd Left), two brothers who were part of the contingent of Old Boys that marched to Nottingham to enlist in August 1914. Samuel was awarded the Distinguished Conduct Medal. Their younger brother George enlisted later in the war when he was old enough to do so. Happily, all three survived the War and able to resume their jobs as moulders at Beeston Foundry (later to become Beeston Boiler Company).